In my last post I looked into the advertisements specifically on cigarette packages themselves. For this post I'll be looking more into the claims companies made, as well as how their marketing strategies changed as knowledge of the health risks increased. (Above: an early example of Camels advertising.) 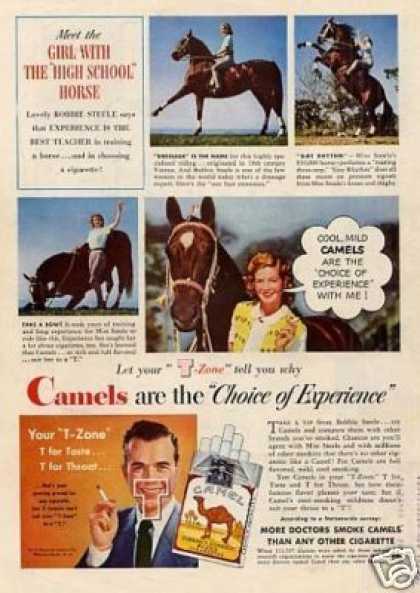 One saying used in many of Camels ads was "Your "T-Zone" T for teeth, T for throat." Claims such as this lost popularity with the rise of government control over the tobacco industry, as well as rising knowledge of health risks by the pubic. "To ensure increased and longer-term growth for Camel Filter, the brand must increase its share penetration among the 14-24 age group which have a new set of more liberal values and which represent tomorrow's cigarette business." They are also famously known for their cartoon mascot Joe Camel (used from 1987 to 1997) which they were forced to remove from their campaigns because of how the mascot was believed to target children. This edgy, leather-clad motorcyclist look Joe Camel's sporting is another example of one of the ways the cigarette industry changed their marketing strategies. No longer could companies claim their products were safe for consumption, so they wanted to sell the idea of someone who was so gritty and brazen they wouldn't care if cigarettes could hurt them. Only cowards and conformists care about uncool things like health. Great research round on claims and marketing strategies on the olden North American cigarette packages! I found it quite interesting that teenagers were targeted by the market by using a cartoon character to draw them in because I always assumed most of the customers would be older. Perhaps in your upcoming rounds of research after your modern day cigarette packages, you could investigate how vaporizers are now the new cigarette and compare and contrast their packaging with their marketing techniques and tactics that draw the customers in. I've noticed that vapes are very popular within the teenager population so brining attention to this issue there could lead to a decrease in vaping. I wish you all the best in your next round of research and here are some links on modern cigarettes and vapes.